I had ordered the next 2 sizes up and this and was very happy with it but i figured i ordered a smaller size to serve under the chairs in my sitting area. It looks very nice, the only problem was that the rug came with a smell, that old leather smell for somereason. other than that, i love it. 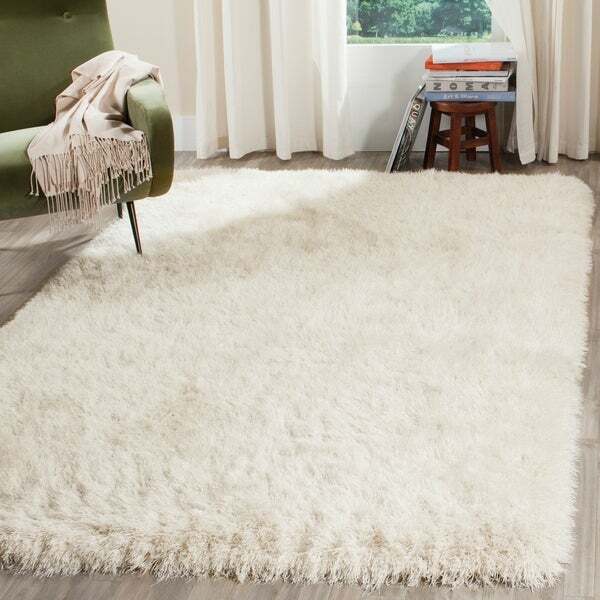 Incredibly plush and silky soft, this lustrous pearl shag rug from Safavieh's Venice Shag Collection brings Euro style to living room, family room and bedroom décor. A feast for the senses, the glimmering yarns used to create the long, deep pile are super soft underfoot and a delightful cushion for the loud sounds of large, high-ceiling rooms. Hand-tufted using durable synthetic threads, this easy-care shag will add European flair to modern home décor year after year. 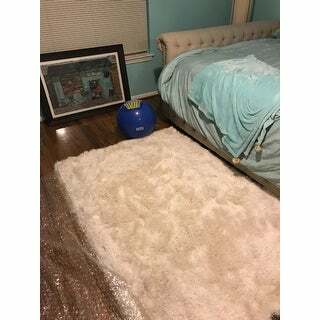 I purchased this Safavieh Venice rug in the pearl color. It is thick and shimmery. It has the thinner type strands as opposed to the thicker yarn-like ones. Seems well made so hopefully it will hold up nicely. This is a soft a pretty rug made very well. It brings out my room everyone compliment me on this rug. It just the right size. We purchased this rug to fit a Parisian theme for our daughter’s bedroom. It fits the bill well—thick and well made. The color is soft, as is it’s texture. Haven’t had it long enough to see how it holds up but we are enjoying for now. Lovvveeee this rug! It's soft and cozy and just how it looks online. Quick delivery and perfect in my living room in front of a chair. Great value! This rug is great. Doesn't shed or come apart. Quality shows on this rug. We like it a lot. It's been holding up to the traffic nicely! Would recommend! i put it in my walk in closet. feels great against my feet! You will need to use a hand attachment to vacuum, or get a shag rake, which is a little bit of a hassle. This rug is better than I expected. Very deep and thick. Looks great in my teenage daughter's room. This is gorgeous! So plush and cute. It will show the dirt but what do you expect when you order a white rug, right? Because I got it on sale, I wont mind having to replace it in a couple of years. This rug was not very plush. I bought it for my daughter's room, so the value was good, but the test is "would I buy it again".... the answer is "no". This rug is a soft cloud of plush wonderfulness! Good quality and lays flat - unlike others that stay curled for weeks after opening. Love it! Cozy, but need to return due to some damage in shipment. Hoping to buy another one soon. "Hello, I just ordered 2 but I need 2 more. There's only 1 left in your inventory. Will you be receiving others any time soon? I'm using them to expand on the other pieces to make one very large carpet. It's so shaggy and with carpet tape, you can't see the seams at all.....but I need one more 🤔"
Unfortunately, we do not have re-stock date for this item. We apologize for your inconvenience.